Ashley Terrace is a building currently under construction in Ann Arbor, Michigan. It stands at 206 West Huron Street, near downtown, and close to the University of Michigan campus. The building has just started to go under construction (in 2006), and should be complete 2007. When complete, it will stand at 13 storeys in height, 10 above-ground, and 3 below ground. The building will have 94 units/rooms. The David M. Dennison Building is a building located on the University of Michigan campus in Ann Arbor, Michigan. The building is located at 500 Church Street. It was built in 1963 by Albert Kahn, and stands twelve stories in height. It is a brick building with a modern style. Twelve floors are above-ground, and there is one basement floor. The high-rise is used mainly for undergraduate education, particularly physics and mathematics. 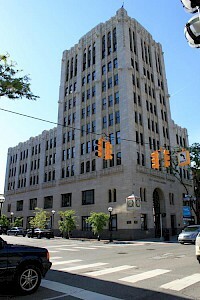 The First National Bank Building is an Art Deco building in Ann Arbor, Michigan. It stands at 210-205 South Main Street in downtown Ann Arbor. The high-rise was built in 1927, and completed in 1929. It stands at 10 floors in height, and is designed with an interesting blend of Art Deco and Art moderne architectural styles. It is composed of primarily steel and terra cotta. 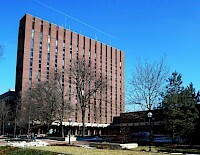 Tower Plaza is the tallest building in Ann Arbor, Michigan. It is located at 555 East William Street. 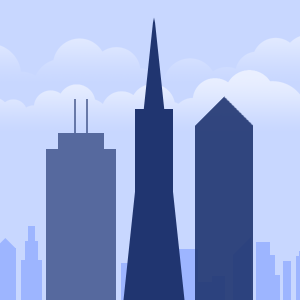 The high-rise was constructed in 1969 and stands at 26 stories, and is 267 ft. (82 m) tall. The residential apartment building was designed in the international style of architecture. Its main materials are concrete and glass. The building is situated close to the University of Michigan, Ann Arbor campus, and is close to U.S. Route 12/Michigan Avenue, U.S. Route 23, and I-94. University Towers is the name of a tall residential apartment building in Ann Arbor, Michigan. It stands at 536 South Forest Avenue. 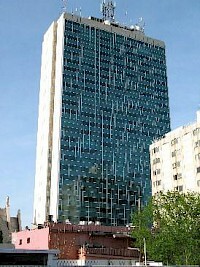 The building was constructed in 1965 and stands at 19 floors, with 240 units/rooms. The high-rise also contains a fitness center. It was designed in the international architectural style, using concrete and glass as its main materials.